HILE is a Finnish design brand which designs, produces and manufactures refined design items, using both modern and traditional handicraft methods of manufacture. HILE products combine usability with high-quality materials and the simple Scandinavian style. As a business, HILE strives to keep the chains of production and transport as short as possible and operates moreover in a socially responsible way. HILE was founded in 2009, but its products have already become well-known. 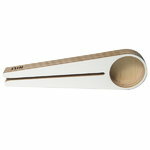 A perfect example of design item from HILE is the coffee scoop and bag closer Kapu, designed by Teemu Karhunen. Kapu is an innovative and elegant product, especially designed for coffee lovers, which combines practicality and high quality materials.